Scrubbis makes it easy to remove algae and other coatings from your hull. You clean it by yourself while the boat is in the water. It is surprisingly easy and takes just a few minutes each time. With Scrubbis you will have a clean hull with maximum speed and lower fuel consumption. 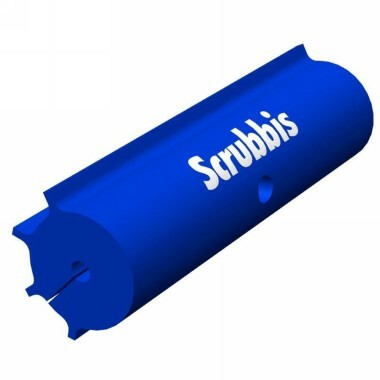 Scrubbis is a cleaning tool which is designed to be gentle on the hull and at the same time an effective tool for removing all kind of coatings. The material, design and function make it unique and fulfill the purpose. The cleaning head has a buoyancy of 2 kg which continuously pushes it against the hull. It has flexible flanges which follows the shape of the hull also when it has rails and edges. The design of the Scrubbis is patented. Scrubbis should be used regularly from once a month to once a week depending on the water. It is important to use it frequently enough to prevent the growing of hard shells. In the Baltic Sea once a month is enough. There is not much effort needed to use the Scrubbis . It is similar to vacuum cleaning. 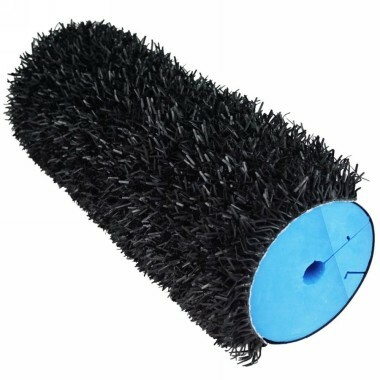 Srubbis consists of the cleaning head with 2 kg buoyancy which has a diameter of 10 cm and a width of 40 cm. 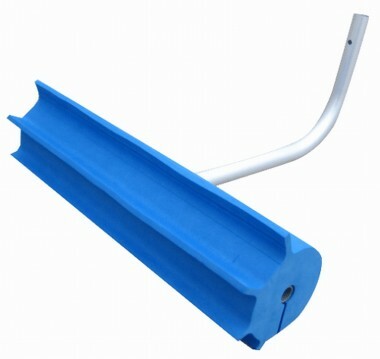 It has an angled shaft with a telescopic handle which can be extended to 2.4 m. There is also an extra extension which increases the length to 3.2 m.
Shaft: Total 3.2m from top to rubber the scrapers. By moving the handle back and forth the cleaning head scrapes along the hull. The built-in buoyancy of 2kg presses the cleaning head against the hull. 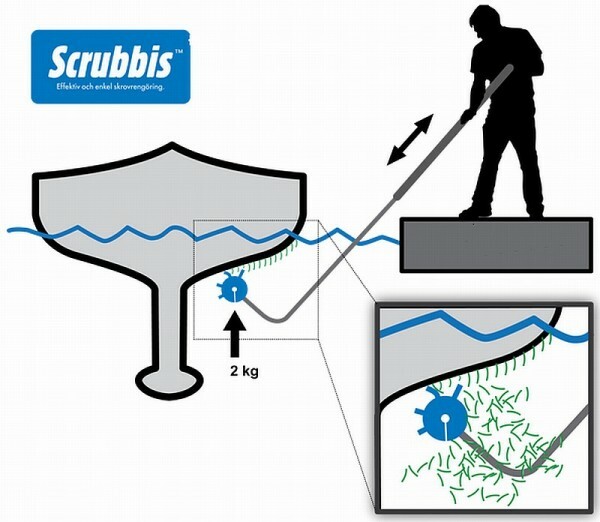 With Scrubbis you clean the hull while the boat is in the water. You no longer need to lift up the boat or drive to a wash station to clean the hull. Using Scrubbis instead of using toxic paints is the solution to a major environmental problem. You do not need to bring the boat long distances to wash stations to clean it. Scrubbis is foldable and easy to stow away in the boat with detachable cleaning head and telescopic handle. Once in the water it is incredibly easy to use wherever you anywhere. Scrubbis is always available when needed. The cost of Scrubbis is so low that it is saved by avoiding the cost of one hull paint or the cost of one to two boat washes. Also a clean hull produces up to 30 percent lower running cost. Scrubbis makes your boat faster! Clean hull gives a lower friction in the water.